I have a few skills in the kitchen and one of those is making a mean cake. I took cake decorating in 4-H and picked up a few skills from there, possibly more than a few but since decorating with kids I think they have suffered a tad. Even though my skills have suffered doesn’t keep me out of the kitchen though. These days though I prefer to look for the easier recipes, you know the ones that I can dress up in a hurry and people rave about the flavor. The flavor is what truly matters to me but it doesn’t hurt to have them look nice. 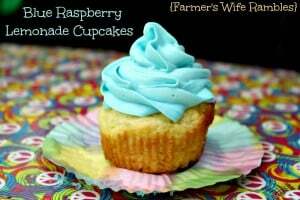 While my Blue Raspberry Lemonade Cupcakes may not measure up to Martha Stewart it doesn’t keep me from trying! These are a hit with the kids because they’re almost like Warheads. Not quite that sour, but very tart and taste like blue raspberry lemonade! 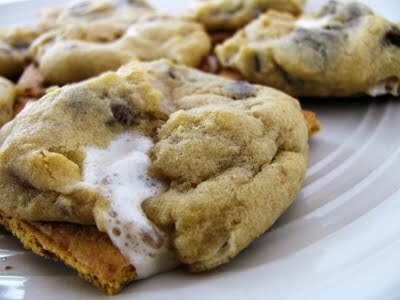 They’re light and fluffy for a hot summer day, too! 1. Preheat oven to 350 degrees. Fill cupcake tin (I love this cupcake tin by Wilton) with cupcake liners. 2. Cream together butter and sugar with electric mixer. Add eggs, one at a time, mixing well after each addition. 3. In a large bowl, whisk together flour, baking powder, and salt. Add this mixture to the butter mixture, alternating with milk. Mix well after each addition, then stir in lemon zest. 4. Bake for 18-22 minutes or until toothpick inserted into center comes out clean. I used a plain vanilla prepared icing and mixed in a packet of blue raspberry kool-aid. If you don’t want yours as tart, only use 1/2 a packet. Do you have a favorite flavor of cupcake you mix up? Perhaps Blue Raspberry isn’t your flavor what other flavor of kool-aid would you use? Don’t miss these other dessert recipes that were a hit with my kids. Most of which can bring memories back from childhood. Yum. You had me at raspberry lemonade! Thanks for sharing at Inspire Us Thursday. Your cupcakes look beautiful. I love the blue icing! Thank you for the recipe! I am certain my little guy will love these! Trying them this weekend! They are so much fun to make and the bright color really draws the kids in. Those cupcakes look so good! I would have never thought of mixing Kool Aid into frosting–what a great idea. That is to funny! Cherry Vanilla sounds delicious as well, it’s funny how I used to always think that Kool-aid was just a drink mix. I love it! What a great idea to add the Kool Aid. I never think to use that for color and flavor… but I’m going to now! They look perfectly wonderful and so summery! The frosting looks heavenly! Can’t wait to try these.